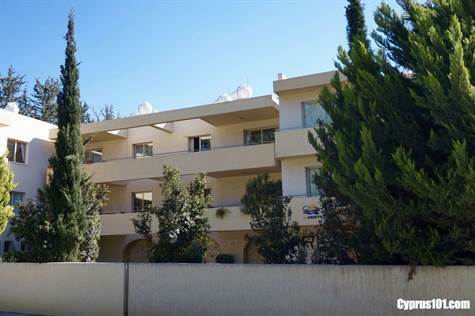 Kato Paphos, Paphos – This well presented two bedroom top floor apartment for sale in Kato Paphos is situated on a small project of 11 apartments and 11 townhouses and is conveniently located for both the touristic area of Kato Paphos and the main town of Paphos. The accommodation features a spacious open plan living area including comfortable lounge, dining area and end kitchen which is is nicely separated from the living space by a breakfast bar. The kitchen is well equipped with built-in oven, electric hob and extractor fan, fridge/freezer, microwave and washing machine. Patio windows in the lounge provide easy access to a private 12 sqm covered terrace overlooking the beautifully landscaped gardens, communal swimming pool and stone feature water fountain. An archway in the lounge leads to two double size bedrooms with fitted wardrobes and a modern fully fitted bathroom. The master bedroom also benefits from a private balcony with pleasant rural views accessed via patio windows. Additional facilities include an allocated covered parking space and nearby large store room which the owners currently use to store their sun beds and outdoor furniture. To the side of the communal swimming pool is a covered barbecue and seating area, ideal for outdoor dining and there are plenty of shower, toilet and changing room facilities. The property benefits from high quality co-ordinating black wrought iron furniture throughout and with it’s terracotta tiled floors has a contemporary Mediterranean feel. It would be perfect as a holiday home or rental investment and there are full title deeds.